The Qing imperial rulers (1644-1911) were of Manchu ethnicity, and ruled over a mostly Han population. For centuries, Manchu women were required to wear long one-piece robes and Han women two-piece outfits that included a jacket and skirt. 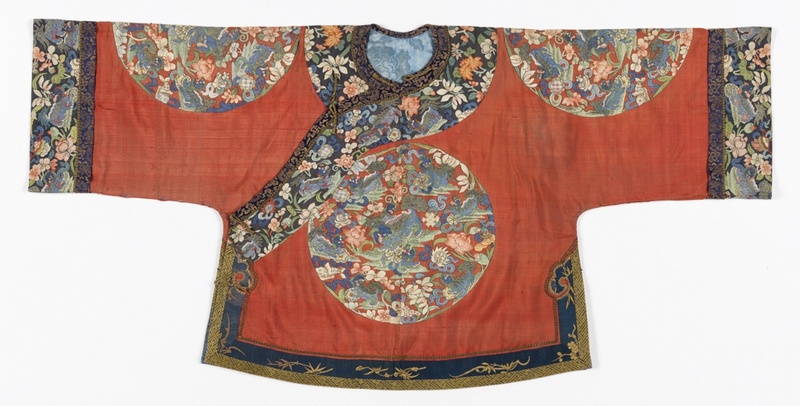 Featuring elements of both traditions, this Manchu jacket demonstrates the increasing fusion of these fashions in the nineteenth century. Imperial decrees by the Qing emperors often criticized these trends, but to little avail. Contemporary ballads described how palace robes worn by Manchu women were “cut in the style of the short jacket and skirt,” the short jacket (magua馬褂) being a key item in traditional Han dress. The decorative focus of this jacket are the roundels of nine lions (jiu shi九獅) cavorting against a background of begonia, lotus, and cymbidium blossoms and auspicious Buddhist symbols like the wheel of law, endless knot, lotus, conch, and vase. The lion motif likely refers to “nine generations under one roof” – the punning ideal of a multi-generational Chinese household in which all family members live together in harmony (jiu shi tong tang九獅同堂). This garment also features multi-bordered sleeves and ruyi-shaped side borders, elements typical of Han dress. Rachel Silberstein is a historian of Chinese material culture, with a particular interest in fashion, dress, and textiles. She recently completed a D.Phil in Oriental Studies at the University of Oxford, in the Department of Oriental Studies. Her dissertation,Embroidered Figures: Commerce and Culture in the Nineteenth-Century Chinese Fashion System, explored how Chinese women’s dress was transformed by the commercialization of handicrafts and the popularization of dramatic culture during the mid-late Qing period. Her interest in Chinese textiles began in the textiles market of Xi’an, where she spent two years teaching and studying at Xi’an Foreign Languages University. Returning to the UK, she studied an MA in Chinese language and linguistics at the School of Oriental and African Studies, prior to beginning doctoral studies at Oxford in 2007. In 2012, she was awarded the Gervers Fellowship at the Royal Ontario Museum to study their collection of Chinese vernacular embroideries. Dr Silberstein has forthcoming articles in Late Imperial China (2015), Costume (2016), and Fashion Theory(2016).